Cleaning up this morning…found a new nook…or maybe it’s a cranny…full of crap…but I guess that’s another story. 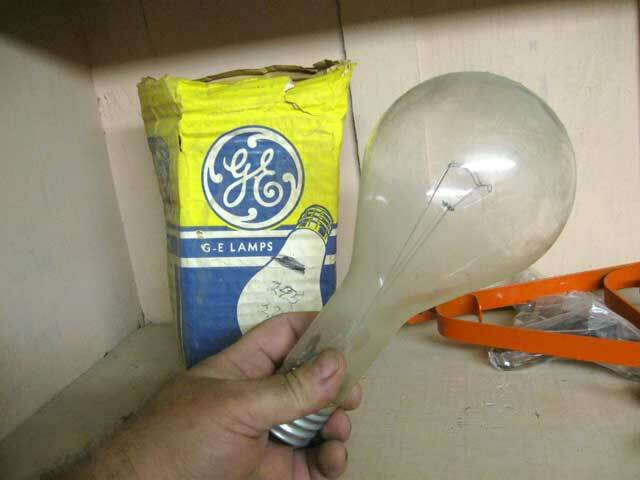 Man, that’s a damn big light-bulb. Oh. Probably a 300W to 500W 120V Mogul Base. Keep it, they are still handy to have for a series load for finding shorts. They still use those at schools, especially the half-silvered version for the auditorium chandeliers – Base Down, and the light bounces out of the bowl and down to the floor.